Somewhere along the line, we have been told that we need to go out and get a job just like everyone else. For some of us, a typical “9 to 5” job just isn’t what we are looking for. There are those of us who just have to do what it is that we love to earn a living to avoid feeling like we are wasting our lives in a rat race. It never fails, when I tell people that I write for a living they automatically assume it’s like what you see in the movies. I’m here to tell you that it is not, it’s not even close. Working a “non-traditional job is so much harder than anything I ever did working in corporate America. 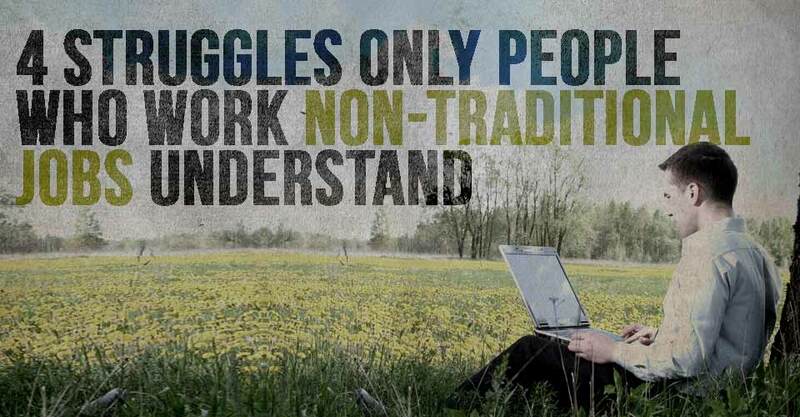 If you’re like me and do something a little different to earn a living, these are struggles you’ll completely understand. First and foremost, the biggest struggle for most of us who do something different for a living is the perceptions of our family and friends who are still stuck in that same rat race that we try so hard to avoid. People assume that because you don’t put on a suit and tie or a hard hat to go to work that you must be lazy and have your head in the clouds. I can tell you that after a 12-year career in the IT industry, I’ve never worked harder or been happier in my entire life. Those of us who take the risks associated with working a non-traditional job do so because we simply can’t be contained in the normal 9 to 5 box that so many people are in. It has nothing to do with work ethic, it has everything to do with being passionate about what it is that we do. Many non-traditional jobs are associated with owning your own business. Back in the days of working for someone else, there was an accounting department, and HR department, and a bunch of other people whose job it was to make sure I could do mine. Now, I am the accounting, IT, HR, operations, marketing, and even janitorial department. That’s on top of what I have to do to make money in the first place. Depending on what it is that you’ve chosen to do, your passion can easily be overshadowed by all the things it takes to keep the ship afloat. A lot of times when you work for yourself or in a job that is a little outside the norm, “time off” is a far away concept. As soon as you stop doing whatever it is that you do for money, you stop making money. Sure, if you manage to make enough money to take time off, which is rare in these types of businesses, often times all you can think about is getting back to work and making more money. At the end of the day, I simply can’t go back to working in corporate America again. Again, it has nothing to do with organization, structure, or even having someone tell me what to do. It is all about passion, and if you are like me – you completely understand that I am talking about.